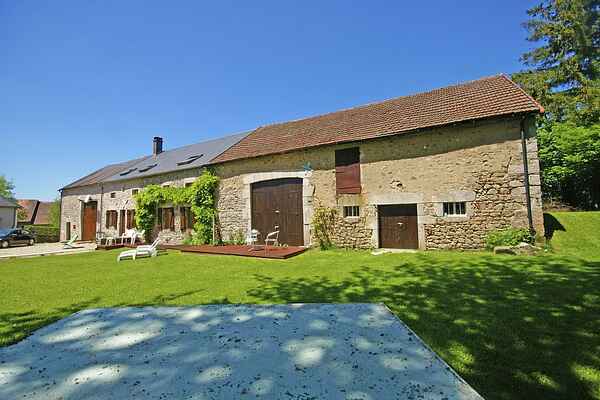 At the edge of the picturesque Dun-les-Places, this nice house with a private covered terrace and grass garden is a fine place to stay. You are in the heart of the Morvan. Next to the house is a large secluded garden with soft lighting and a nice table. Lovely for long evenings with a nice glass of Bourgogne! You'll find a baker and grocer in Dun, a supermarket in Lormes (18km). The beautiful hilly walking area of the Morvan starts right behind 'your' house, waiting to be discovered. Are you the adventurous type? Then a drive with an all-terrain vehicle is something for you. You can rent one at only 500m from the house. Swimmers will gain from Lac des Settons (17 km). Here is a lovely beach with numerous water sports. Culturally, there is much to experience. We recommend visiting the pilgrimage town of Vézelay (39km) and the picturesque Avallon (36km). In Vezelay you can admire the abbey church Basilique de Vézelay. You'll also discover the many art shops. Avallon is surrounded by fortifications dating from the Middle Ages. You will find many historic buildings, including the church of Saint Lazare. There is a golf course in Vic-sous-Thil (36km).